Vladimir Putin is no saint. He's probably a mass-murderer and is no supporter of general civil liberties in Russia. He's is also apparently ignorant of economics, having both rescued the Russian economy with massive tax cuts and hobbled it with trade embargoes. But in the world of foreign relations today he is the most adept and wise major player in the game. And the world is a better and more peaceful place for it. 2013: during which the Barack Obama and the US government sought to invade Syria under the pretext of charges which would later prove to be unsubstantiated or even fraudulent. This new war was stopped by none other than Vladimir Putin, who, seizing on an offhand comment by John Kerry, maneuvered an agreement forcing the US to back down or lose the war for public opinion. The US would then resort to a more covert strategy of funding ISIS while pretending to fight them: the primary enemy of ISIS is the Assad regime in Syria. After the Ukrainian government in late 2013 rejected an economic deal with the EU in favor of a better deal from Russia, US-backed forces overthrew the Ukrainian government. The new government includes powerful neo-Nazi and anti-Russian factions -- one of its first actions was to take legal steps to marginalize the use of the Russian language. Predominantly-Russian Crimea then voted overwhelmingly to secede from Ukraine and rejoin Russia. Western governments decry the referendum as fraudulent because of Russian troops moved there after the Ukrainian coup; other parties point out that Russia had an existing agreement with Crimea to have troops there and that the mostly-Russian Crimean population feared for its safety under the new Ukrainian regime. From what I can tell, the more educated, honest, and thoughtful parties in the debate tend to side with Russia here. Now in the present day, the US has recently authorized itself to conduct attacks on Syrian soil. This is ostensibly to attack ISIS, but in reality seems more likely to weaken Assad. Again Putin has stepped in, sending Russian troops to fight ISIS and bolster Assad. Putin is in this way directly working against actual US interests (which want Assad gone) -- while helping promote the cause which the US purports to stand for (fighting ISIS). What we have here is a pattern: Obama's America makes a move to expand its power overseas, and Putin's Russia then counters with a move that demonstrates superior intelligence, foresight, diplomatic gamesmanship, and ethical integrity. Obama is outmatched by a far superior opponent, and the world death-toll from US wars is significantly lower for it. 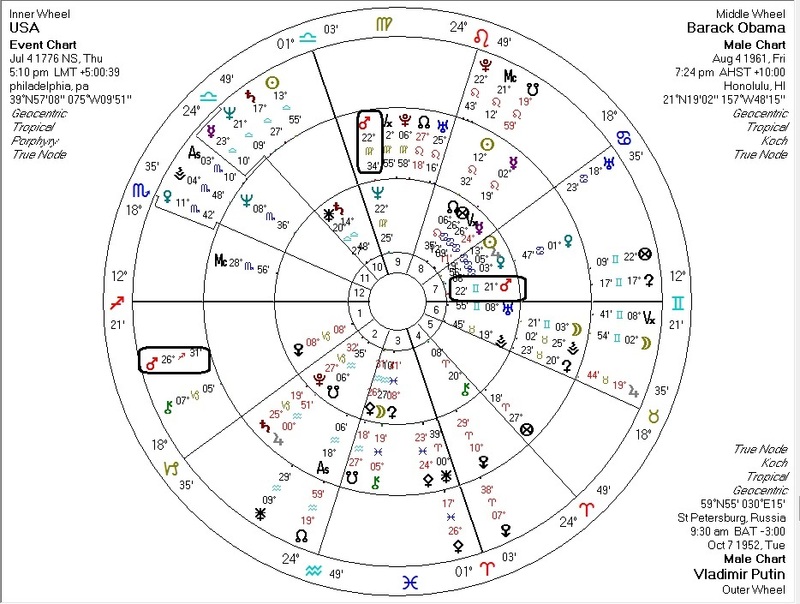 A couple of astrological notes here, comparing the US chart with Obama's and Putin's. Putin's Mars opposes the US Mars and squares Obama's Mars. Hence: conflict. The opposition is easier to reconcile than the square despite being a more powerful aspect. This may suggest that while Putin most certainly will work against Obama's interests, he does not necessarily work against American interests. Also interesting (though I haven't done much with Pallas-Mars in synastry) is that Putin's Mars squares Obama's Pallas but sextiles the US Pallas. This may well be a metaphor that Putin's skillful meddling works against Obama's "ethics" but actually agrees with the general "ethics" of the US itself. I'm sure there's a lot more wealth to mine out of the comparison of these charts.